Priya of Mahro Rajasthan's Recipes and Reshmi of Rasoi came up with the wonderful idea of starting a friendship chain in USA and CANADA for food bloggers and non-food bloggers and hence was born Maitri. To know more about maitri and be a part of it click on the banner right side. 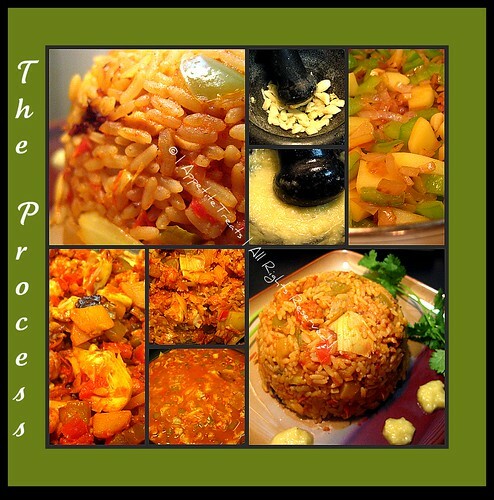 Masale Bhaat is a maharashtrian rice dish usually made during the weddings. This is the marathi version of our vegetable pulao which is very spicy and flavourful.The reason i made masale bhaat for maitri was the mystery ingredient. Rajee Mani of Everyday Cooking was the wonderful lady matched with me for maitri, she sent me a package consisting of beautiful place mats, a card and the mystery ingredient. When i first looked in to it i thought it was some kind of masala powder and my guess was either biryani masala or five spice powder. I mailed rajee and it was a no, so i asked rajee to reveal the ingredient. She mailed me saying that it was Goda Masala, a popular spice blend widely used in maharashtrian dishes. Goda Masala is made with a mix of many spices that includes coconut, just a spoonful adds so much flavour to the dish. Thanks Rajee for introducing me to Goda Masala and the wonderful gifts! My job next was to cook a dish that has Goda Masala and blog about it. Since this was the first time i have heard about or seen Goda Masala it was hard to cook a dish with it. I found this Masale Bhaat at Madhura's recipes and made few changes to the original recipe. Heat oil and ghee in a pan, add bayleaf, green chilles and onion, saute until onion changes color. Add ginger garlic paste and saute for a minute. Add turmeric powder, red chilli powder, goda masala and the roasted masala powder, mix well for a minute. Add the vegetables, salt , sprinkle some water and cook for 5 minutes. 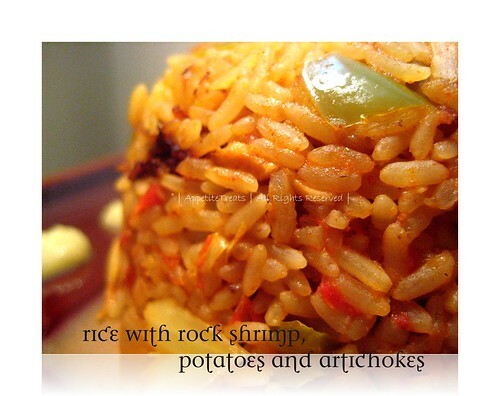 Mix in the rice along with tomato, peanuts and water, check for salt. Bring it to a boil and cook on high heat for 5 minutes. Close the lid and cook on a low flame for another 10 minutes or until the rice is done. Mix gently, serve hot with raita. This is an easy breezy south indian style biryani made with less ingredients and a simple process. I used shitake mushrooms, you can use any type of mushroom you like. Heat oil and ghee in a pressure cooker, add bayleaf, cardamom, cloves, star anise, cinnamon and fry. Add the onions and saute till the onions are soft, add ginger garlic paste and saute, now add in the mint and cilantro leaves and fry. Add the tomatoes along with little salt and saute till they become soft and mushy. Add mushrooms and all the spice powders, mix well and saute till all the water from mushroom is evaporated. Now add the rice and fry for a minute to coat with all the masala. Add the required water and salt. Close the lid and put on the whistle when the pressure comes. Allow it to on a medium heat for one whistle and switch off. Wait for the pressure to settle down, open the lid and mix gently. 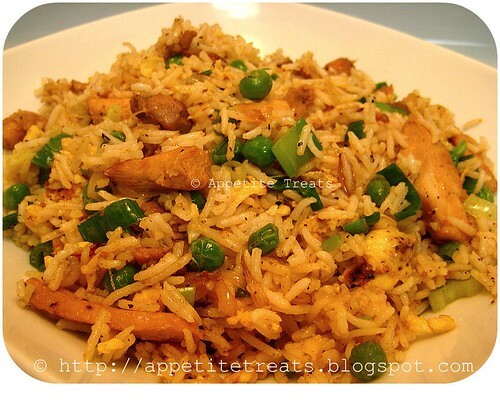 Fried rice usually comes in handy when we are not in a mood to cook an ellaborate meal or there is leftover rice. This one pot meal can be made in a jiffy, whether you make it with vegetables or with chicken. I have chosen the later . 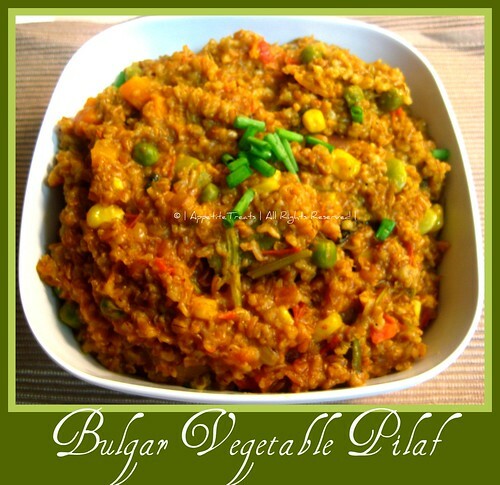 A very easy and quick recipe made with bulgar. Wash and soak bulgar in water for 20 minutes. Drain and keep aside. Heat oil and butter in a pressure cooker. Add bayleaf,cardamom,cloves,cumin and fennel. Saute till the aroma is released. Add in the onions, green chilies and saute till translucent. Add ginger garlic paste and saute for 2-3 minutes. Add the tomatoes and saute till they turn mushy. Now add turmeric powder, chili powder, coriander powder, salt, mint and coriander leaves. Mix well. Add the vegetables to the masala and mix for 2-3 minutes. Add the drained bulgar and mix well to coat the masalas. Add two cups of water. check for salt. close the lid and switch off after 3 whistles. Allow it to cool, mix well and serve with raita. Don't get confused with the name ! Wash and soak the rice in water for alteast 1/2 hour. bayleaves. saute for a minute. Add in the ginger garlic paste and saute for 2 minutes. till they become mushy . If using a pressure cooker, allow 2 hisses and turn off. Heat oil and ghee in a pan , add in bay leaves, cinnamon, cloves, cardamon, cumin seeds and fennel seeds, add in the green chillies, garlic and onions and saute for 5 minutes on low flame. Add in salt, green peas, rice, and fry for few minutes ,now add in the coconut milk and water , transfer the mixture to a rice cooker. 1 cup basmati rice [ soaked in water for 20minutes]. 1/2 cup carrot, sliced into cubes. 1/2 cup green beans, thinly sliced. 1/2 cup cauliflower, separated into tiny flowers. 1/2 cup mushroom, sliced thinly. 1/2 cup potatoes, sliced thinly. 1/2 cup bell pepper of any colour, sliced into thin stripes. 1 big onion, thinly sliced . 2 green chillies, cut into halves. Heat ghee and oil in a pan.Add bay leaves,cardamom,cinnamon,cloves and fennel , let them fry for a minute.Now add the green chillies and onion , fry them . Add ginger garlic paste , fry them to release the raw aroma.Add tomatoes , fry them till they are tender. Add the veggies , curry powder,chilli powder,coriander powder and turmeric , mint leaves ,mix well. Add rice ,salt and mix well.Add water and transfer the whole mixture into a rice cooker. if cooking with a pressure cooker , put the whistle on and leave it in simmer for 10 -12 minutes. 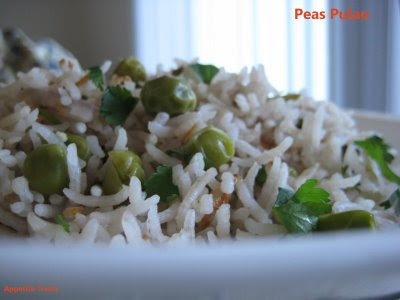 If u are using the frozen peas , thaw them and add it to the rice at last . As the peas is already cooked and freezed ,they become mushy when u cook them again. If not add it along with vegetables. 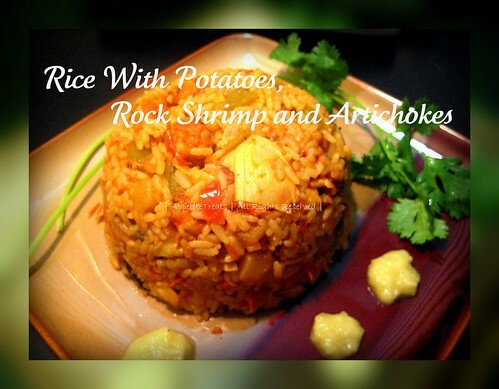 When rice is cooked, mix gently adding few drops of ghee and parsely. 2 cups basmati rice [ soak it in water for abt 20minutes ]. Heat oil and butter in a pan.Add cardamom and bay leaves , fry until the aroma is released.Now add onion and green chillies , fry until they are tender. Add the ginger garlic paste and fry well.Add the rice to the onion and mix well until the rice is nicely coated with butter and oil. In a separate bowl mix 1 cup coconut milk with 1/4 tsp turmeric powder.Now add the coconut milk to the rice mixture and mix it with salt. Transfer the mixture to a rice cooker.If using a pressure cooker , put the whistle on and leave it in simmer for 10minutes. U can serve it with raita or any type of chicken curry.